Bob Dylan and Mavis Staples will join forces to open the new Wintrust Arena near McCormick Place on Oct. 27, Mayor Rahm Emanuel's office announced Monday. 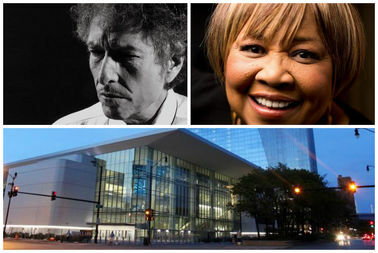 SOUTH LOOP — Bob Dylan and Mavis Staples will join forces to open the new Wintrust Arena near McCormick Place on Oct. 27, Mayor Rahm Emanuel's office announced Monday. "The music of Bob Dylan and Mavis Staples defined generations and I can't think of a better inaugural performance for this new venue on the South Side of Chicago," Emanuel said. Staples, a Chicago native known for redefining gospel, blues and soul music, was inducted into the Rock and Roll Hall of Fame in 1999. Dylan was inducted in 1988. In a 2015 documentary, Staples, 78, revealed that Dylan, 76, proposed to her in 1963. She turned him down. The two legends were nominated for a 2003 Grammy for their duet on "Gonna Change My Way of Thinking." Tickets go on sale Friday, according to Dylan's website. The two music icons will tour together starting Oct. 13 in Southern California. Wintrust Arena will also be the home of the DePaul Blue Demons basketball teams and the WNBA's Chicago Sky basketball team. Dylan, the 2017 recipient of the Nobel Prize for literature, will be accompanied by his band.